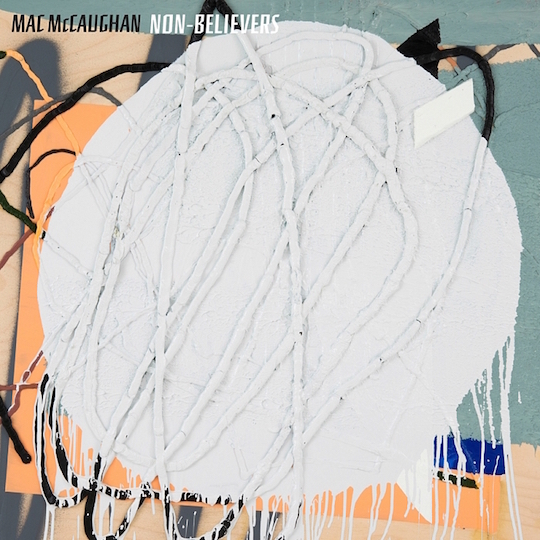 Mac McCaughan’s Non-Believers feels familiar. Despite this being his first album under his own name, fans of McCaughan from Superchunk and Portastatic will feel at home. The album opens with a heralding of synth frequencies, pulsating almost like their breathing. It sounds like the signature tones from Close Encounters of the Third Kind. Non-Believers heavily relies on synthesizers and drum machines to set the mood, departing from McCaughan’s previous work; however, anyone familiar with 80s new wave will instantly be comfortable. The electronic sounds are bold and colorful. McCaughan layers them thickly, rarely leaving any space. On “Mystery Flu” a single root tone persistent throughout the song, allowing guitar and shaper synth notes to play on top of it. Along with McCaughan’s bittersweet vocals, the total effect is comforting. This is bedroom music, expect that bedroom is spacious and full of color (maybe like Tom Hanks’ room from Big). The album is restless throughout as McCaughan sings of youthful, but lifelong problems like finding yourself and missing the people you love. Non-Believers is full of holograms, box batteries, and other items that remind us that the future never quite feels like what you wanted it to when you imagined it. But McCaughan keeps his perspective. The past isn’t always how we remember it. On “Real Darkness,” he pokes fun at a sullen character: “How did you get so dark with all this sunlight around? How did you get so pale?” The latter half of the album includes the two most Superchunk-like songs in “Barely There” and “Box Batteries” that keep the record from being nothing but hazy, romantic synth for 40 minutes. Non-Believers takes a lot from the past, but it doesn’t get mired in it. McCaughan will play the Cat’s Cradle Backroom with Flesh Wounds on May 23. Tickets are $12 via Ticketfly.